Except my son said, “I don’t like blueberry muffins. I don’t like it when fruit gets cooked.” Okay, I knew that, but I didn’t think it translated to muffins. Seriously? Being ever so fast on his feet, though, he suggested an alternative. How about using those peanut free almonds in the cupboard and make some chocolate chip muffins with them? I’d come across these safe almonds while shopping a couple of weeks ago. They’re by Blue Diamond (who used to make awesome peanut free almond butter *pout*) and while we can get other peanut free nuts from a local grower, almonds haven’t been available to us until now. And I am so grateful. They are a nutritionally wonderful snack, full of protein, magnesium and vitamin E, plus good fats. And they play well with so many other foods, like baked goods. Once again, I’ve swapped out some all purpose flour for coconut flour, because I have it on hand, and I like baking with it. You can use another cup of A.P flour, or even whole wheat flour instead. Preheat oven to 425F. 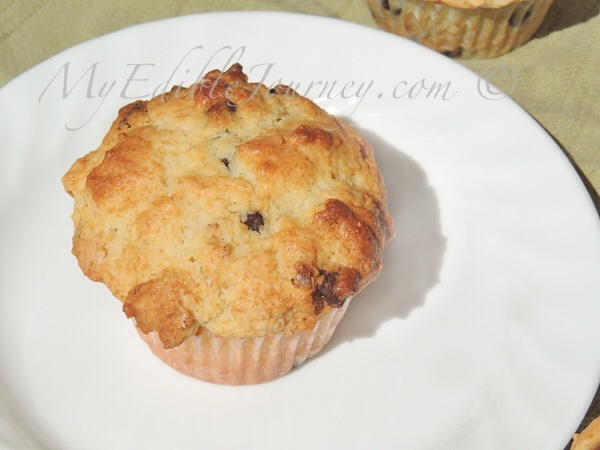 Spray or line 12 regular sized muffin cups and set aside. In a medium bowl, whisk together the flours, baking powder and salt. Set aside. In a small bowl, combine the eggs and sugar. Beat in the almond extract, yogurt, milk and butter. Pour the wet mixture over the dry ingredients and mix until *just* combined. It will be thick. 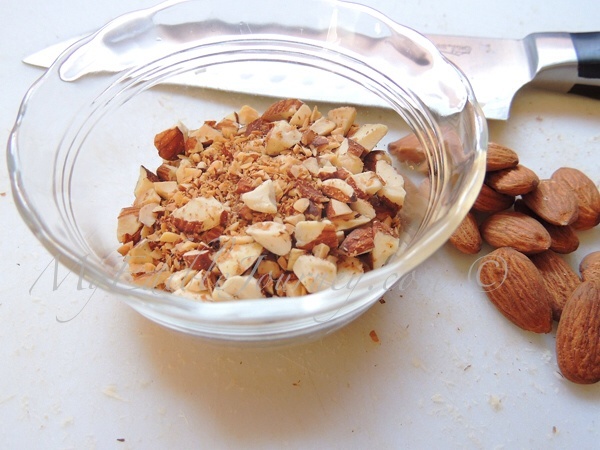 Fold in the almonds and chocolate chips. Spoon the batter into your prepared muffin cups, filling them right to the top. Bake for 5 minutes at 425F and then reduce the oven temperature to 375F. Continue baking for another 25 minutes, until the tops are golden and the centres test clean with a toothpick. *Disclosure – Blue Diamond has no clue that this blog exists, and did not furnish me with any product. I just really like their peanut free almonds. This entry was posted in Desserts, Muffins, Snacks and tagged almond, chocolate chip, coconut flour, muffin, peanut free on April 3, 2014 by Mama B. Looks like a fortunate change of plans, yum! That it was. We have a new recipe in our snack file now. I’m glad your son doesn’t like cooked fruit because these look amazing! !